Once you have assessed your kitchen needs and decided how you want to go about executing them, it’s time to put pen to paper and start designing your new kitchen. On this page, we will give you some general concerns about kitchen refurbishment you should keep in mind when you are planning your new kitchen. For instance, you don’t want to end up with a kitchen that has the sink positioned too far away from the fridge. You can transform it into a remarkable space unlike anybody else’s. Manufacturers and designers have seen it all, and the end result is that you can have all the amenities you want and need, even in a tiny kitchen. Savvy, space-saving products are available for the owner of the apartment-size condo, co-op, or townhouse kitchen. You’ll find that convenience doesn’t have to come only in the large economy size. To create a distinctive space, your first move is to look at your kitchen with an eye to what might serve as a focal point. A large window, alcove, or long wall can be the start. Take advantage of a bank of beautiful windows with an eye-catching counter that runs the length of the window wall. If you love to entertain and are lucky enough to have ample space, consider setting your room up to include two back-to-back kitchens; one with a full-size range, a fridge, ovens, and a sink, and the other with an ice-maker, a wine chiller, a second sink, a mini-fridge, and a microwave, plus an abundance of storage. Pretty much anything you dream up can be executed with the help of a talented design team. It’s up to you! Whether your space is large or small, and whether the end result you want is pretty or pretty wild, in fitting your kitchen you’ll do best if you stick close to the following basic recommendations. 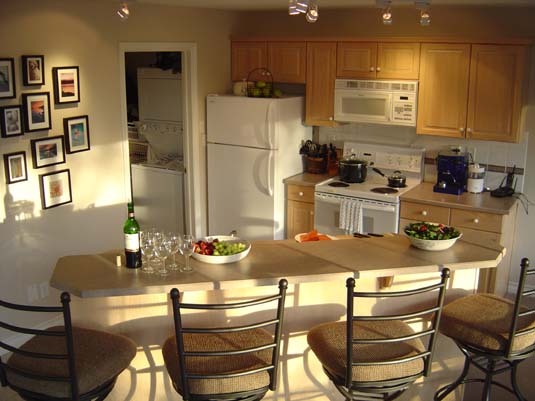 - Try to keep the straight-line distance between the sink, fridge, and cooktop between 12 and 23 feet. - Allow for 36 inches of counterspace to the right and 30 inches to the left of the range and sink if at all possible; if not, allow a minimum of 24 inches and 18 inches. - It’s tempting to place a tall fridge and built-in wall oven next to each other, but try not to; each needs its own landing space on both sides of the appliance for safety. - Try to include a minimum of 10 linear feet of both base cabinets and upper cabinets. - Utilize lazy Susans to make potentially wasted corners fully functional. - Use pull-out drawers rather than reach-in, conventional cabinets for greatest convenience. If you’re retro-fitting existing cabinets, have pull-out trays installed. - Consider barrier-free design and products. They make life easier for children, pregnant women, and seniors as well as individuals with disabilities. They’ll also add to the longevity of your kitchen. The perfect custom kitchen fittings design can be suited to your every dream and needs of you and your family, and also to be able to fit the boundaries of your budget. Below are 5 custom kitchen trends to be aware of when your are planning for your custom kitchen refurbishment. 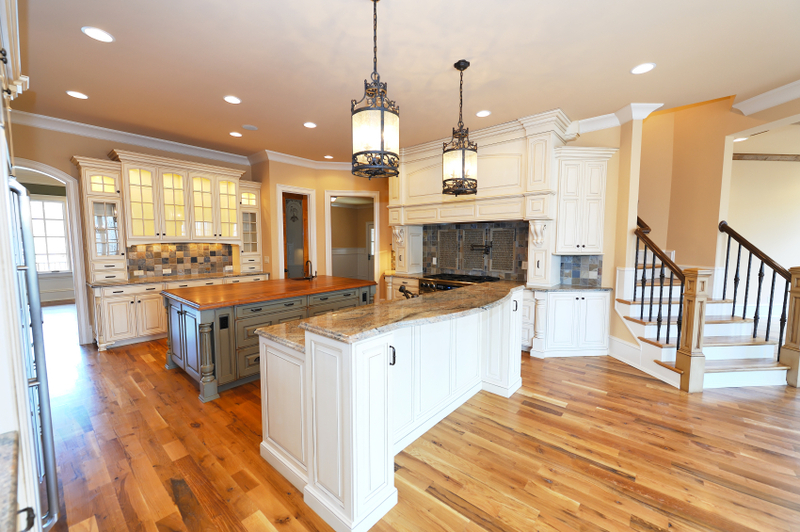 Adding hardwood mouldings to kitchen cabinets can provide a richness not found in other features. Mouldings are available in oak, cherry, and maple. They can provide your cabinets with such details as fluted columns, valances, cornices, galley rails and open shelves. These can help to combine function and beauty to your kitchen. Mouldings can also provide a custom look to stock cabinets. Examples of the uses of mouldings on cabinetry include: installation around corners and along the face of cabinetry to minimize the square look of cabinet, using in soffit areas, and installing on top of cabinets to add a crown moulding. Solid hardwood flooring makes a great choice for the kitchen because not only is it beautiful, it has practical features as well. It is thicker than other flooring materials which makes it good for insulation, and sound proofing. It will last of many years because it can be refinished many times. If you just want to change the look and color of your hardwood floor, you can just sand it. You never need to replace the entire flooring. The trend toward free-standing cabinetry from the desire to get away from the cookie cutter look by creating cabinets that look more like furniture, including such features as molding, feet, and valances. This type of custom cabinetry is available in both traditional and contemporary styles. Unfitted custom kitchens are those that are classically designed pieces used to conceal full-size appliances such as ovens, stoves, dishwashers and refrigerators. Custom kitchens with the unfitted look can also create more room for windows, columns, displays, and any other design element that can give a kitchen more character. Kitchen appliances are becoming more and more sophisticated and allowing for greater customization, personalizing, and convenience. This has helped make the kitchen the high-tech center of the home. A good inexpensive kitchen wall decorating idea is faux painting. Faux painting techniques include: color washing, sponging, stippling, and ragging. Faux painting can add texture variation and a more interesting look to normally plain walls. Faux painting requires some skill but you can find books on how to do it, and you can usually get free lessons down at your local paint store. You might want to practice on large pieces of cardboard first before you attempt to paint the walls. Tiles Using colorful tiles to create a backsplash in your kitchen is an easy way to add a new, professionally designed look to your kitchen decor. Tiles can help you to be more creative and experiment with different tones. This is an inexpensive and simple to be able to liven up the kitchen space. Tiles are available in many shapes and sizes. It is simple to see that you are extatic about your writing. Look forward to all your future posts turn out as well.Thanks! Considerably, the post is really the sweetest on this worthy topic. I harmonise with your conclusions and will thirstily look forward to your next updates. Saying thanks will not just be enough, for the fantasti c lucidity in your writing. I will instantly grab your rss feed to stay informed of any updates. De lightful work and much success in your business endeavors! Thankyou, I didn’t new that, thanks. Superb article! I totally consent along with you.